A guest post from one of our skincare affiliates and favorite brands, Annmarie Gianni. You know good health habits will keep you looking and feeling great now and for years to come. Staying in shape, watching what you eat, and monitoring your physical and mental health prevents serious medical conditions in addition to giving you energy for the activities you enjoy and extending your life expectancy. Nothing promotes vitality and slows the aging process more than living an active, healthy lifestyle. However, no one is immune to time. You’ll find that, despite your healthy habits, the years will eventually begin to show. A maturing body may still feel strong and vital as you continue to take care of it, but at a certain point, many healthy men begin looking older than they feel. 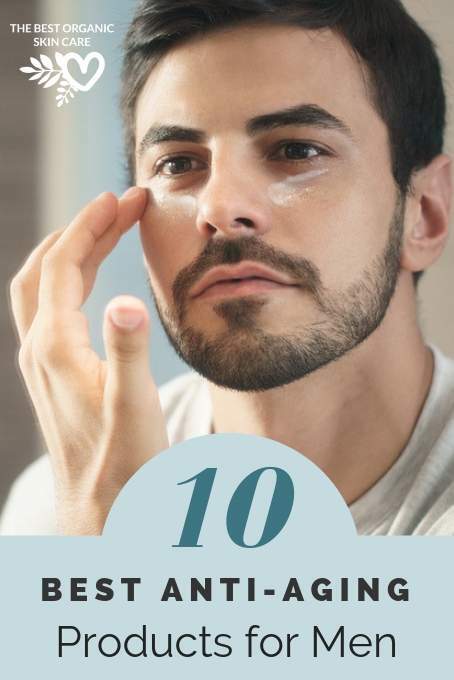 Exercise and nutrition can only do so much for your appearance— that’s why many men turn to these 10 great anti-aging products for a little help. With nourishing ingredients that target your aging skin and hair, these products help keep your outside looking as young and healthy as you feel on the inside. Facial cleansers are the most important product you need in your skin care lineup. They remove the grime and bacteria that clog pores, cause blemishes, and generally weather your skin. Use a gentle cleanser that’s designed to wash away excess oil and contains vitamins and moisturizing ingredients to replenish your skin. Face soaps with harsh chemicals can actually age your skin by altering its pH level and stripping it of its natural oils, so always check the ingredients on the package. After washing, the next best thing you can do for your skin is to moisturize it. Aging inhibits natural oil production, leaving you with dry, thirsty skin. Rehydrate your skin every day after washing with both facial and body lotions that contain nourishing antioxidants and vitamins. A high-quality moisturizer will protect your skin from drying environmental factors and lock in your natural skin oils for healthy-looking skin. Like moisturizing lotions, face oils are full of hydrating fatty acids and essential oils that quench dry, aging skin and leave your face feeling soft and supple. Face oils are great for locking in moisture after a hot shower or bath while your skin is still wet. Little lines start appearing at the corners of our eyes as we age. That’s where eye cream comes into play. Eye creams reduce the appearance of aging by plumping skin to smooth lines and stimulating skin cell rejuvenation so that wrinkles don’t develop. For best results, use an eye cream twice daily and keep it in the fridge to wake up puffy morning eyes. See our Guide to the Best Organic Men’s Skin Care. Serums nourish your skin with antioxidants, glycerin, and essential vitamins that your skin loses as it ages. They help promote skin elasticity, regulate oil production, and reduce the appearance of fine lines and dark spots on your face. Serums are sometimes superior to other skin care products because they’re water-based so they are absorbed into your skin quicker than typical moisturizers. Use one daily after washing and fully drying your face. Nothing brightens and freshens your skin more than removing old, dead skin cells and letting a new layer of epidermis shine through. Exfoliants do just that. However, you must be sure that you avoid using them too often. It takes a couple of weeks for new skin cells to emerge, so don’t exfoliate more than twice a month or you risk irritation. Using a product with fine grains or jojoba beads will help prevent irritation too. Like exfoliants, facial masks are used to slough off old, dead skin, as well as minimize pores and wrinkles, leaving you with fresh, glowing skin. Unlike exfoliants, however, you can use a mask multiple times a week. It can become a relaxing ritual and an easy way to care for your skin. Choose from many kinds of masks including clay, sheets, and even homemade! Too much sun exposure damages skin, leaving it dry, weathered, and even leathery-looking over time. Fight sun damage (and skin cancer) by using sunscreen on any exposed skin when you plan to be outside for an extended length of time and utilizing a facial sunscreen daily. Look for sunscreen of at least SPF 15 for daily use and SPF 50 or higher and waterproof varieties for outdoor activities. When you use the right night cream, you can fight age in your sleep! Night creams are meant to repair your skin after being exposed to environmental factors like UV rays and pollutants all day long. They heal, hydrate, and tighten skin overnight, minimizing the appearance of blemishes and wrinkles. Use a night cream generously each evening–and, of course, getting a good night’s rest will help your skin too. Thinning hair and balding are telltale signs of aging in men. Fight that receding hairline with shampoos and revitalizers that are specially formulated to stimulate the scalp and promote hair growth or that leave what hair you do have looking thicker, fuller, and generally healthier. Nothing beats a wholesome diet, regular exercise, proper rest, and other good health habits to keep your body healthy and looking great, no matter your age. That said, it doesn’t hurt to get a little help from the nourishing vitamins, antioxidants, and other natural ingredients found in high-quality anti-aging products. You nourish your body inside with healthy foods and supplements, so why not do the same for your outside! Skip the nasty, toxic chemicals with unfamiliar names found in many skin and hair products. These substances can irritate your skin or seep into your body and cause the very damage you’re trying to prevent with anti-aging products. Instead, opt for certified-organic products made from botanical ingredients that sound familiar and will revitalize your body with essential nutrients. 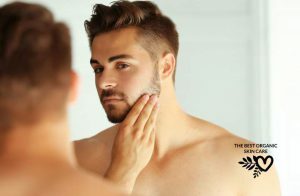 Aging happens to all men, but with the right products in your anti-aging arsenal, you can slow the effects of time and let your great health shine for many years to come. 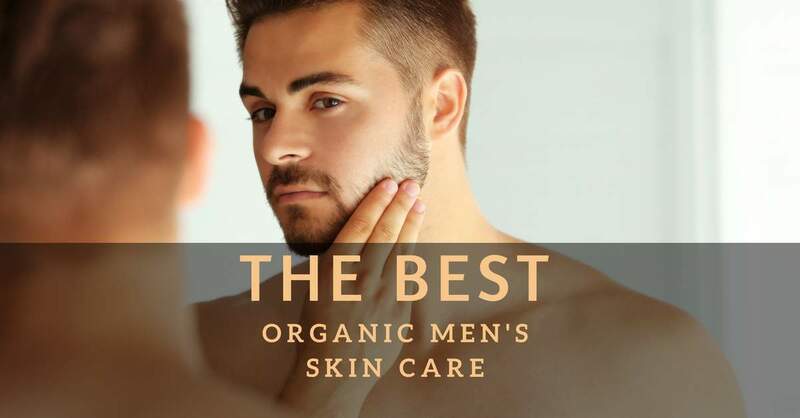 See our Guide to the Best Organic Men’s Skin Care. 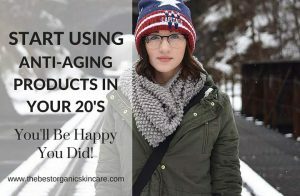 Start Using Anti-Aging Products in Your 20s…You’ll Be Happy You Did!